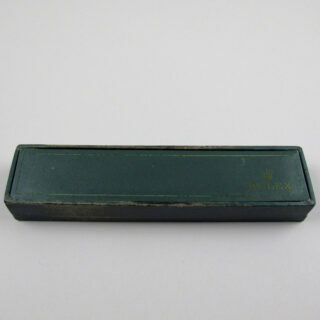 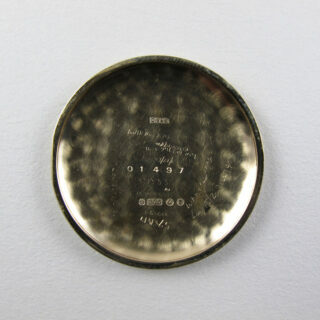 This is a very attractive Rolex wristwatch which is hallmarked for the year 1956. 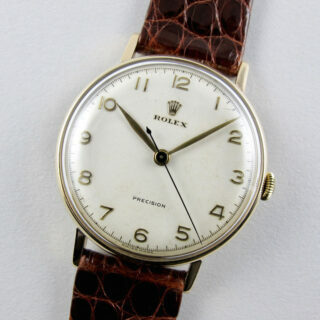 The watch has a yellow gold case, the sides and lugs of which are milled in a ‘coin-edge’ style, a design seldom seen on vintage Rolex watches. 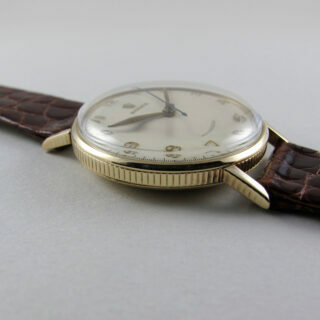 The dial is in attractive condition with a gentle, warm patina to the surface and the gold coloured, leaf-shaped hands, contrast with the blued steel of the centre seconds. 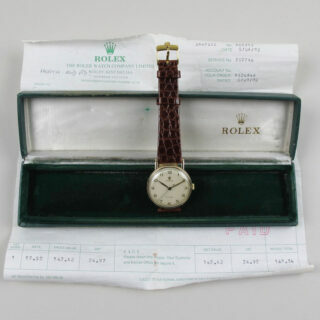 Accompanying the watch is a Rolex presentation case (green leather covering rather worn) and a Rolex service receipt from 1992. 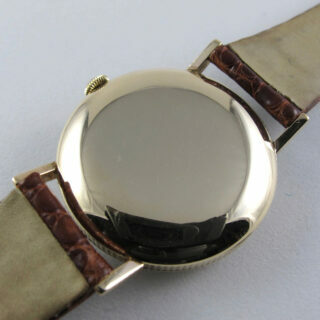 The watch is fitted with a crocodile leather strap with a Rolex, gilt-metal, pin buckle. 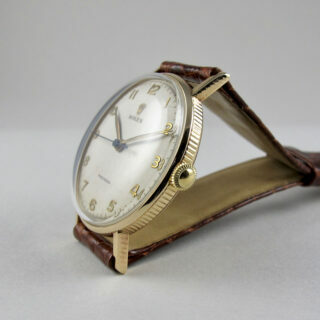 This model was available with a variety of different dial designs. 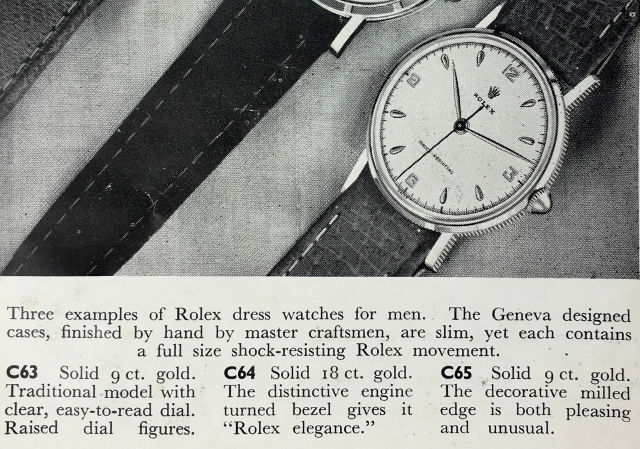 Below is an extract from a 1954 Rolex catalogue which shows the same model as the present watch but with Arabic and dagger indexes. Interestingly, the retail price for this model in 1954 was £54 – this was £5 more expensive than the newly released Rolex Explorer which was listed in the same catalogue at £49. 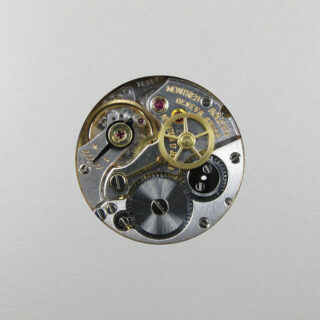 All our watches have been fully serviced and overhauled and are sold with a one year guarantee and detailed Black Bough certificate. 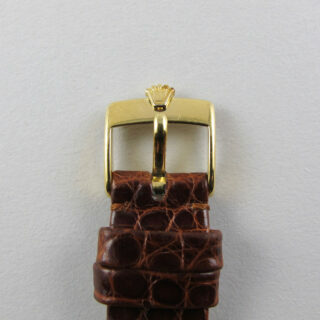 Please note that, due to CITES restrictions, the crocodile strap cannot be shipped outside the European Union. 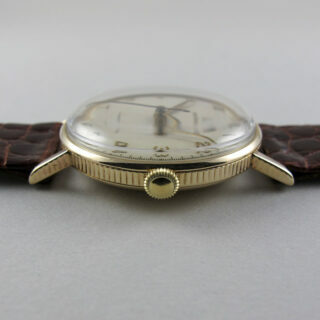 If the watch is to be shipped outside the EU, we are required to removed the crocodile strap and replace it with a calf leather strap.